Offer Terms: 18+. New customers only. 10 Free Spins on registration and mobile verification. 2 Free Spins for every £1 of first deposit up to 100, available on selected games only. Not available using Neteller or Skrill. 3-day expiry on Free Spins. £10 min deposit + 2.5% fee (min 50p). Cash balance withdrawable anytime + £2.50 fee. Full T&Cs apply. BGO Bingo originated in 2012 and originally ran on its own specialised software. In 2015 however, they decided to abandon this idea and adopted the products of market leader, Playtech. In 2017 the brand updated to the latest HTML Playtech software, and now the site is better than ever. One of the standout features of BGO Bingo is its brand mascots. You will have no doubt come across many TV and magazine advertisements fronted by several different actors and presenters if you live in the UK. At first glance the site has a really professional and sophisticated feel, and it comes across as quite a luxurious brand. Everything is very clearly set out, and the platform is really simple to navigate. The bingo on offer is really varied and you’ll find vast varieties of 75 and 90-ball games. There are 9 dedicated BGO rooms, aswell as larger branded rooms such as Deal or No Deal and Lucky Numbers bingo. The casino and slots section is absolutely massive and you’ll find a huge assortment to keep you busy.There are even 10 live casino options too including Roulette, Baccarat, Blackjack and Hi-Lo. Registering at the BGO Bingo site takes just a few minutes, and you’ll be able to take advantage of the great welcome offer as featured above. All other promotions are updated regularly and include fantastic weekly specials with huge payouts. BGO offer a brilliant Candy Club loyalty scheme too, where all players are rewarded with fantastic treats the more you play. The brand boasts of its exceptional customer value and care, and promises great gaming with first class customer loyalty. A strong feature at BGO is the no wager policy. This is extremely unique and is hard to find on other gaming sites. The welcome bonus at BGO is awesome. Just click on the link at the top of this page for more details. Terms and conditions apply, and all players must be aged 18 or over. Other promotions are really plentiful and constantly update weekly, monthly or seasonally. This enables players to take advantage of new offers and bonuses on a regular basis, and keeps players coming back for more. The Vault is an ongoing promotion/loyalty scheme that offers players the chance to fill up a personal Boost Bar. Over time this bar will fill up and unlock boosts thats will appear in your account vault. These boosts will offer free fair spin rewards with absolutely no wagering requirements. Play in the live casino this week, and gain 10% cashback on all your losses up to £100. Cashback will be credited straight into your account, and will be yours to use as you please with no wagering requirements attached. BGO Bingo is owned and operated by BGO Entertainment Limited in Alderney. The site is licensed and regulated by the Gambling Control Commission in Alderney and Great Britain. There are 14 rooms in total at BGO and these include a mixture of unique BGO rooms, as well as bigger branded rooms too. The main bingo variants available are both 75 and 90-ball games, and each room offers something completely different. You will find Deal or No Deal, Who Wants To Be A Millionaire and Lucky Numbers which all offer exciting branded rooms with big payouts, and the unique BGO rooms offer a more personal and intimate feel. BGO provides players with a huge selection of casino games and additional slots titles. You will find over 500 popular slots such as Lucky 3, Stampede, Raging Rhino and Guns N Roses, and the casino offerings give several choices of Blackjack, Roulette, Bacarrat and Hi-Lo. There are some fantastic progressive jackpot slots on offer too with current payouts reaching over £2 million. Please read all terms and conditions upon registration, as details are always subject to change. There are no wagering requirements on the majority of bonuses, however some of the larger progressive jackpots may contain wagering so always best to check. It is also worth noting that all withdrawals have a £2.50 charge. 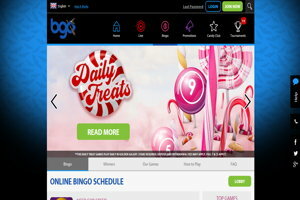 It’s clear that BGO Bingo are an established and well endorsed site with great gaming. The bingo and additional casino games are hugely varied and of great quality, and the promotions are current and offer excpetional value. The most exciting feature of the site is the no wagering requirements, and this really helps BGO stand out from its competitors.